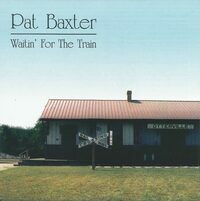 All songs recorded by Patrick Baxter - Copyright 1998-2014. Stepping Across, Daddy's Girl, and Rat Pack written by Patrick Baxter. I recorded All Of Me for my wedding; we used it as the recessional song as we exited the church. It’s a fun song, it has a nice message, and it just makes us feel good! All Of Me makes me smile! I recorded Somewhere Over The Rainbow for Elena’s Mother, shortly after she passed away May 5th, 2014. I don’t know if she can hear it, but I know she can feel it. Feelings of love and connection act as eddies between God (non-physical existence) and Physical Reality. Love is like a magnet on Essence, whether that Essence is currently residing in a physical body, or is currently “Physically Unavailable”. Rebirth must occur with some connection to a pre-existing condition of Love. In other words: It Had To Be You! Daddy’s Girl took a long time to finish. I wrote part of it after Dot (my Dalmatian, and Tabitha’s “sister”) was stolen from our yard in March 1999 (we never saw her again). But I didn’t finish writing the song until after Tabitha died in March 2010. I finally recorded it at home in June 2014; 15 years after I started it. I also recorded My Favorite Things for my wedding; we used it as our first dance. It’s a bit nostalgic, and a wee bit “dark” sounding, but it challenges me to remember the good stuff, even when it sometimes makes me a little sad that we lose some of that perspective to be able to appreciate the good stuff, with our innocence. Stepping Across is from my 1998 CD Waitin’ For The Train. I wrote this song after a friend of mine committed suicide. I was trying to work through not only the sadness and loss, but also a lot of frustration. If I had known, could I have made a difference for him? Stormy Monday is an improvisational blues jam that I recorded one afternoon, four days before my Wedding (a stormy Tuesday afternoon; it rained so hard that day). I had started that morning with the intention of recording a different song (the last song for my wedding CD), but I wasn’t satisfied with how it was going, so I started playing around with this old blues song and ended up recording it. Improvisation usually captures something that pre-scripted recording misses; it’s that connection to the music, and not just following what is expected, that allows the Universe and my Essence to express itself through me. It captures the spontaneity and possibility. Rat Pack is also from my Waitin’ For The Train CD. I wrote it to capture the spirit of adventure and somewhat reckless abandon with which a group of friends and I approached life in our youth (though no-one was ever really hurt by our high jinks). Rat Pack was my first attempt at pseudo-improvisational recording. Although I had written the rhythm and structure, I had purposefully avoided writing the melody lines and guitar solos so (I hoped) I could capture that “care-free” feeling. 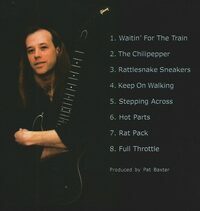 We recorded the “bed tracks” (rhythm guitar, bass, and drums) one day, and I went back into the studio the next day and improvised the melody lines and guitar solos. I think it did help capture that “care-free” feeling; it still sounds “fresh” to me.